The NFLPA filed a grievance against the NFL on Tuesday, challenging the league's new policy regarding players and the national anthem. The league announced in late May that players and team personnel on the sidelines must stand when the national anthem is played before. Individuals will be allowed to remain in the locker rooms, but teams will be fined if when on the field they "do not stand and show respect for the flag and the anthem". Shortly after that announcement, the players union said its members were not consulted about the changes and it would review the new policy and "challenge any aspect of it that is inconsistent with the collective bargaining agreement". The NFLPA also said the move contradicts statements commissioner Roger Goodell and New York Giants owner John Mara made to union leadership "about the principles, values and patriotism of our league". Formally announcing its challenge to the policy, the NFLPA said in a statement: "Our union filed its non-injury grievance on behalf of all players challenging the NFL's recently imposed anthem policy. The union's claim is that this new policy, imposed by the NFL's governing body without consultation with the NFLPA, is inconsistent with the collective bargaining agreement and infringes on player rights. "In advance of our filing, we proposed to the NFL to begin confidential discussions with the NFLPA executive committee to find a solution to this issue instead of immediately proceeding with litigation. The NFL has agreed to proceed with those discussions and we look forward to starting them soon." The issue appears on the cusp of dragging into a third consecutive year, having come to the surface in the 2016 preseason, when then-San Francisco 49ers quarterback Colin Kaepernick kneeled during the national anthem to protest social injustice and racial prejudice in the United States. 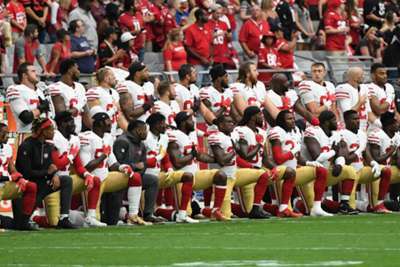 The topic has dogged the NFL ever since, in part because US president Donald Trump latched on to the issue and has continued to criticise the players. As recently as last week, Trump described the NFL's new policy of allowing the players to remain in the locker room as "worse" than protesting. "Isn't that worse than not standing?" Trump said at a rally in Montana. "That doesn't play. I actually think in many ways its worse." Meanwhile, the NFL is seeking to have dismissed a grievance filed by Kaepernick, in which he claims he has been blacklisted by the league and its owners and teams, since initiating his protest. He remains a free agent, having not been signed for the 2017 season either.